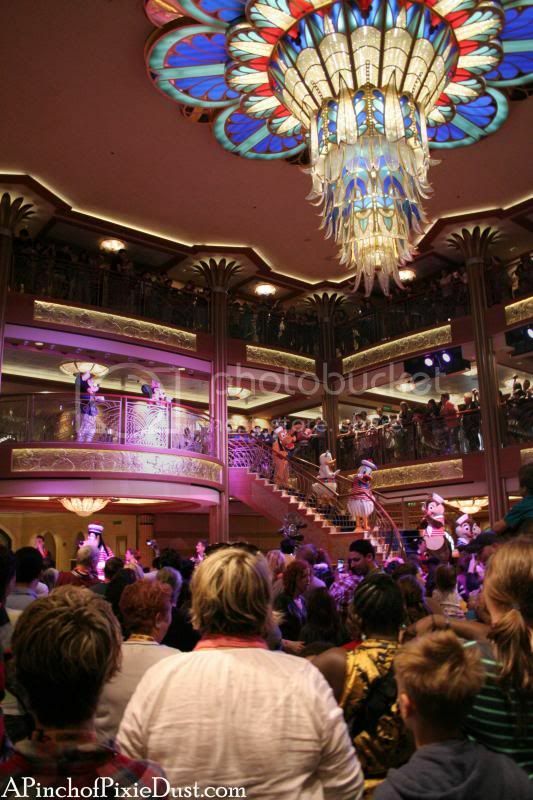 There are so many different things to do on a Disney Cruise. There are shows, meals, activities, classes, movies, events...and then there are the characters. 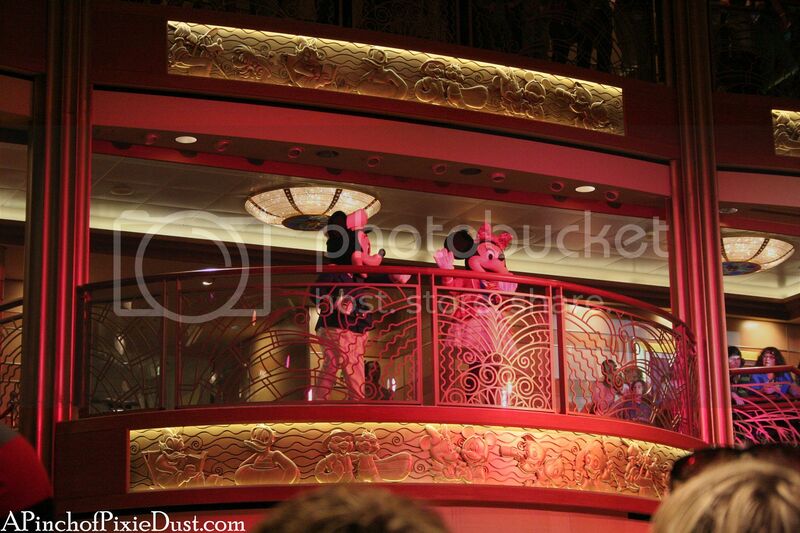 Where else on the high seas can you cruise with Mickey, Minnie, and friends? We did a three-night Bahamian cruise on the Disney Dream, and I thought it'd be fun to share some of the character highs and lows and tips and tricks from our trip! 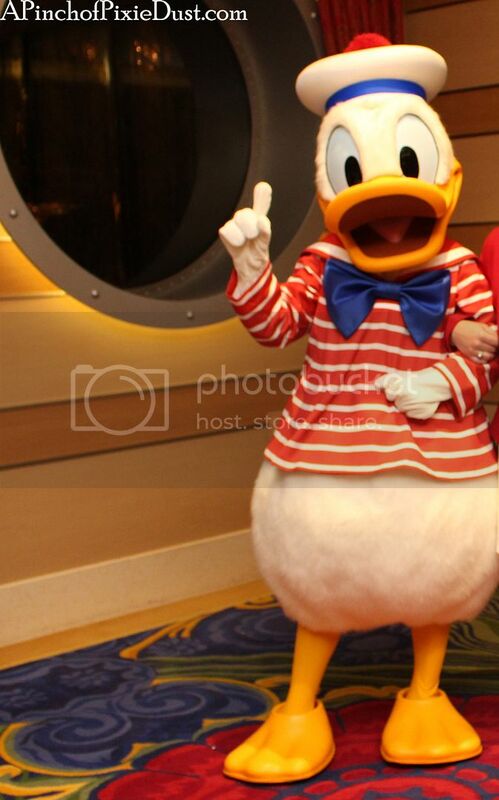 CAPTAIN MICKEY! I love how everyone went straight to get in the Captain Mickey line. Forget about check-in, first you have to say hello to the main mouse! 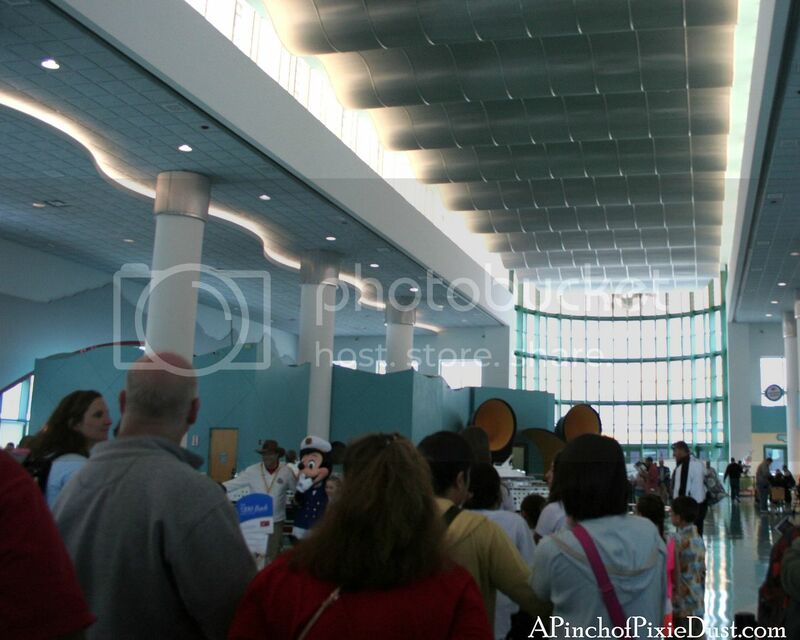 The characters in the terminal rotate throughout the afternoon - you might find Minnie or Goofy. 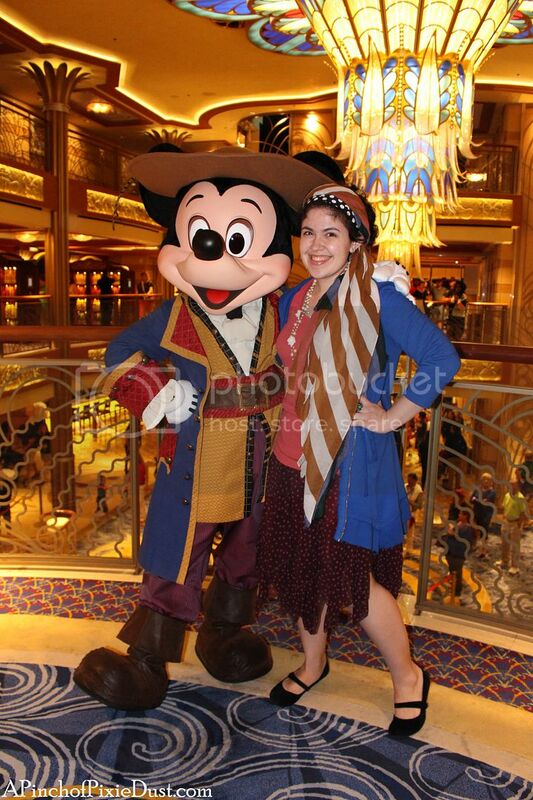 Mickey and the gang seem to have different outfits for each appearance on the cruise! At the terminal and on the first evening, they'll be decked out in sailor suits. 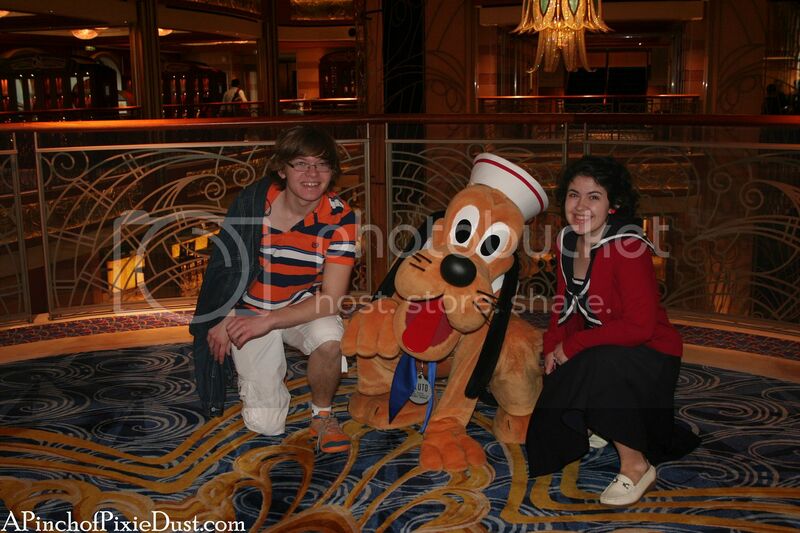 So if you're wearing something nautical yourself, make sure you catch them for a photo on the first day. They won't be wearing their sailing attire for photos again (at least if you're on a three-night cruise) until the "See Ya Real Soon" event on the last night. 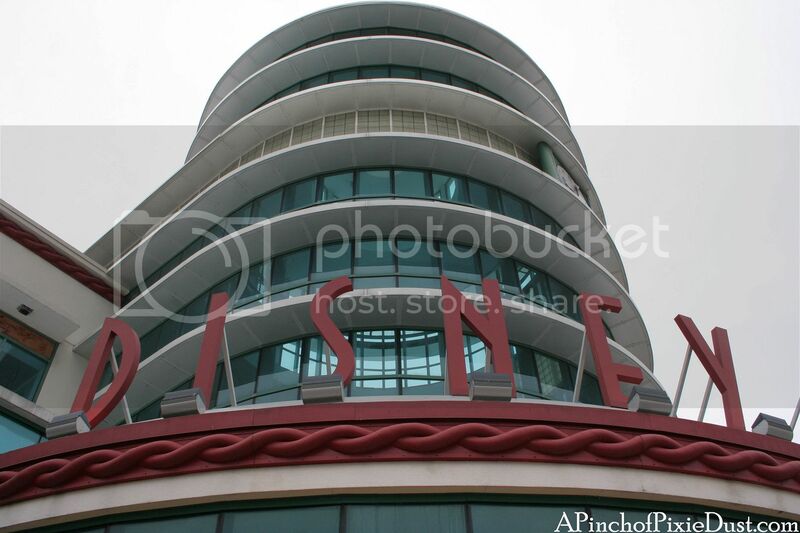 We arrived at the terminal first thing - around 10:00 - they started letting arriving guests into the building around 10:30. Make sure you check in online - you are assigned a time slot for when to arrive at the terminal, and when you check in online you can pick an earlier one. You do still have to check in at the terminal desks in person, but the earlier you do the earlier you'll get on the ship! Boarding starts at 11am and goes as late as 4pm; the later you arrive, though, the more hours of your cruise you're giving up. 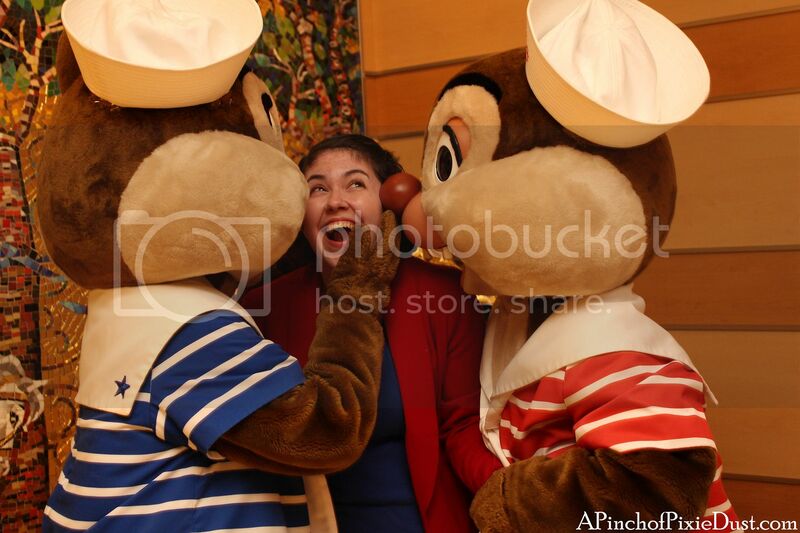 When you get there first thing you have time for fun things like lunch on the ship and, of course...characters! 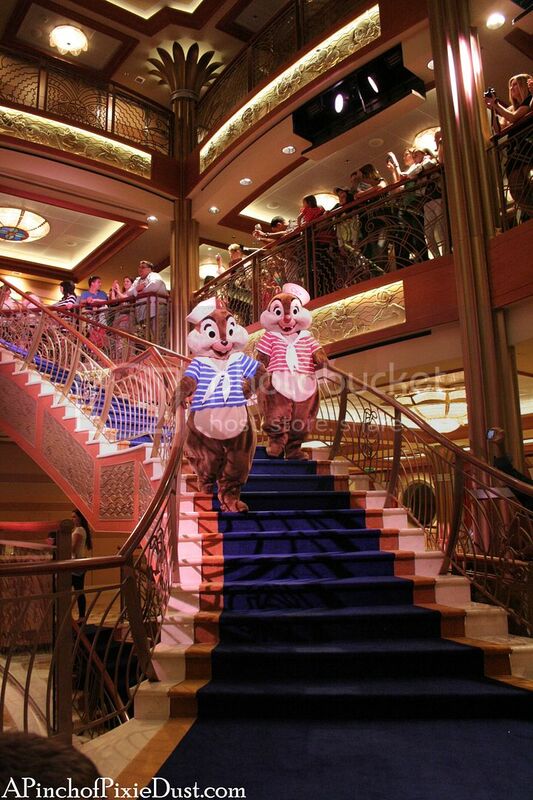 Pluto and Donald were greeting arriving guests onboard the ship on the balcony above the Atrium. Pluto was meeting and greeting guests on all fours from the ground - I had never seen Pluto do that before, but I thought it was fun - nice for the little kids! The line had only one other party in it! If you're used to the very long character lines at the parks, the lines on the cruise will be a pleasant surprise. They're not always as non-existent as the Pluto line, but they were so much better than the parks. 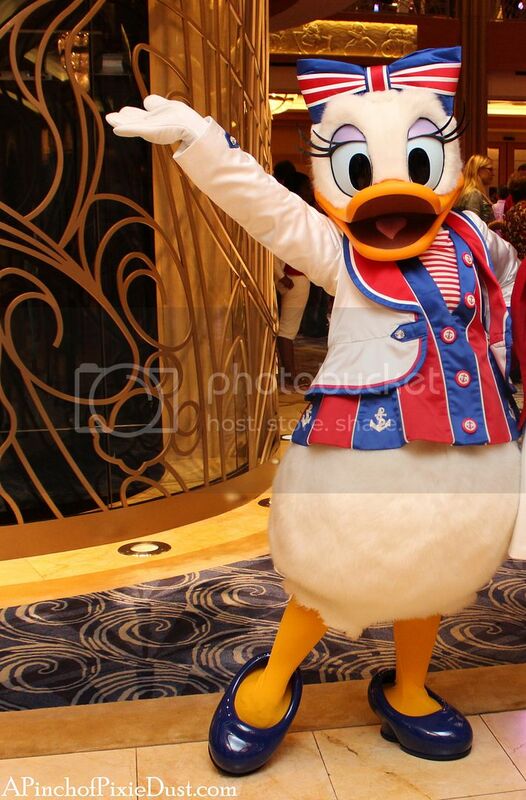 You'll also see the characters on the first cruise day during the Sailaway Party! Normally it takes place up on deck, but inclement weather moved it inside to the Atrium for us. It's cute - although I have to admit, it's more exciting on deck. 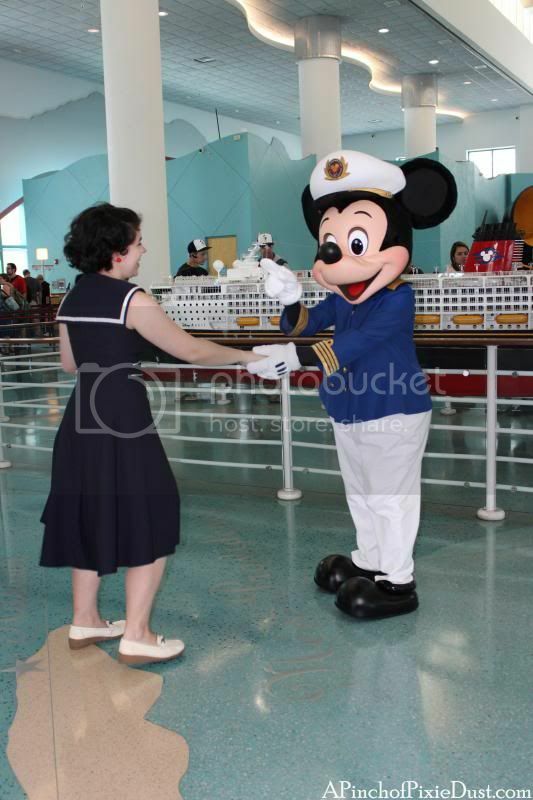 Many of the character meet and greets during our cruise took place in the Atrium. 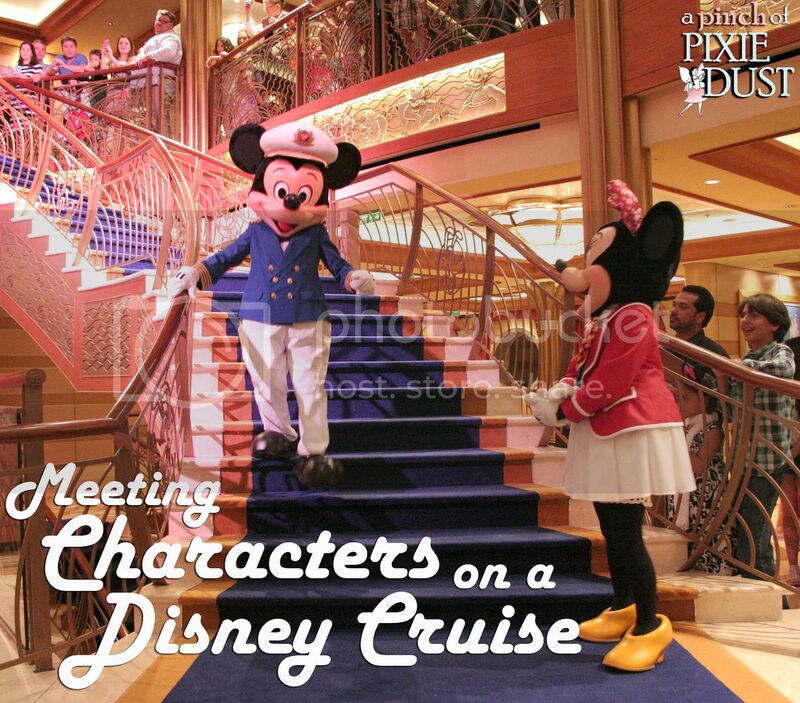 Each day's navigator has a list of all the characters appearances and times in it - and so does the Disney Cruise app! I loved the app, especially for keeping an eye on characters. You can see the schedule of events for all the days of the cruise, and since it uses the onboard network (and not the super-expensive actual wifi) you can use it anywhere on the ship for free. Just make sure you download it from the app store before you leave (when you do have real wifi!). One of the character spots is in a little room off to the side of the Atrium. In between meet and greets they close the doors, so that the backdrops can be varied for different characters. ...maybe we should talk about the Princess Gathering! It happened two or three times on our cruise - in the morning and the afternoon of the second day, and I think it happened again on the Castaway Cay day. 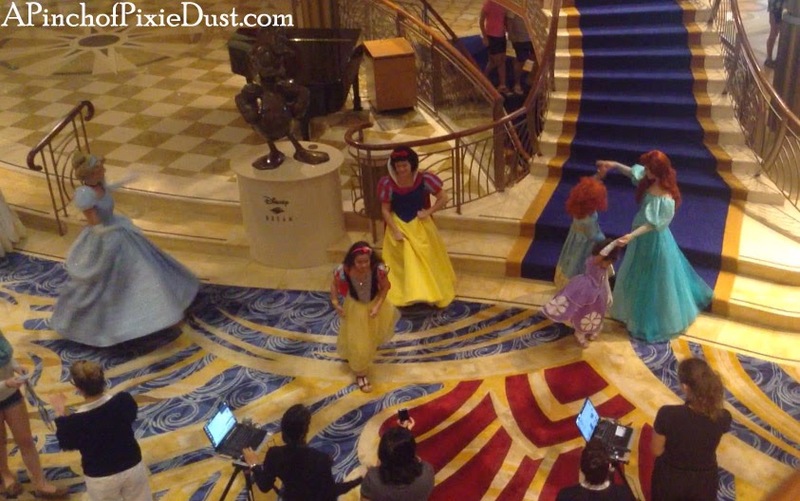 There were five princesses lined up to meet you - Belle, Tiana, Cinderella, Snow White, and Ariel. This is the only line that gets kinda insane - see the people standing along the red rope? It curved all through the Atrium and back around behind the stairs. If you are planning on doing this, you might want to arrive 10-15 minutes early to get in line. I skipped the Princess Gathering (I had recently visited every single princess to get their input on the Prince Charming problem...lol), but I did walk through the Atrium while it was going on. In fact there were a lot of fellow grown-up princesses like me just pausing on the balconies above to watch the fun below. Sometimes the line is slow, so one of the princesses might not have a guest with them for a minute or two. Of course they would stay in character, dancing around dreamily, gossiping with a fellow princess. They would look up around the Atrium and wave at you like they were SO glad to see you, which was just sweet. Now we come to my only big complaint about the meet and greets - and photo ops in general - on the cruise: the cruise photographers. 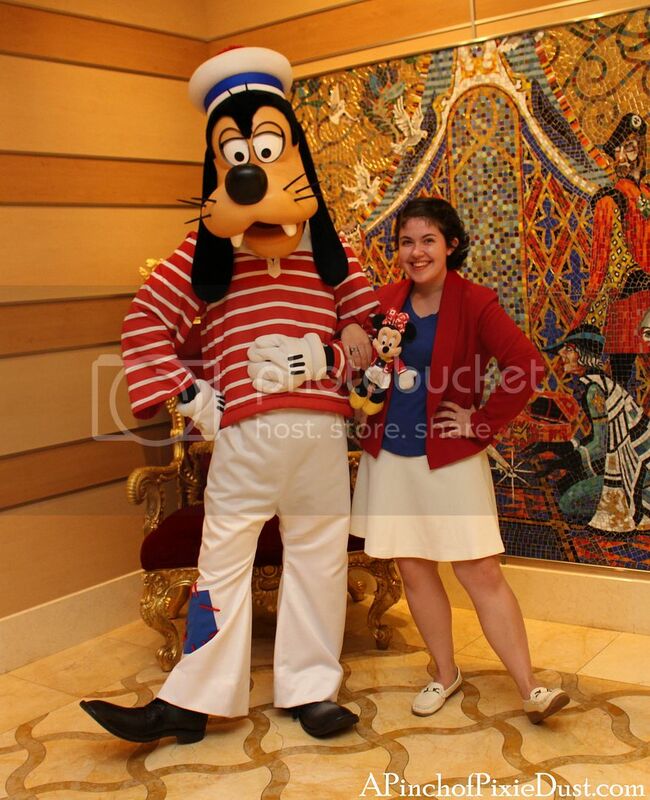 These are not like photopass photographers because they are not Disney cast members; they work for an outside company. 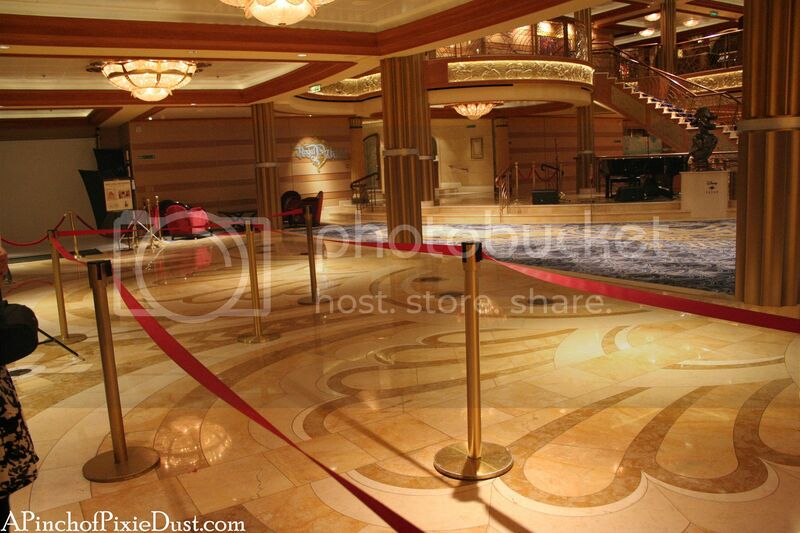 The cruise photographers WILL NOT take a picture with your camera. They are not allowed to by their company, so don't even bother asking. If there is a real cast member nearby (there almost always is if you're meeting a character) they are allowed to snap a photo with your camera, so ask them. 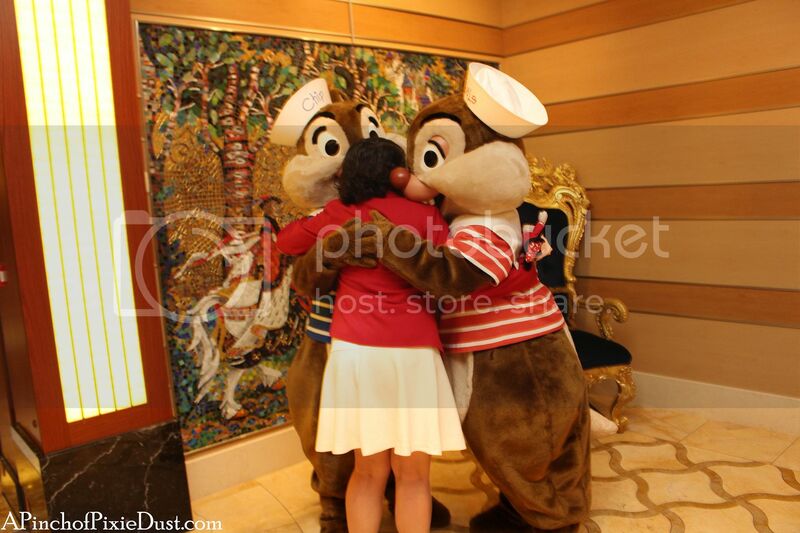 It was frustrating, though, because at some photo ops there was no cast member available. And unfortunately we ran into some very unpleasant and proprietorial cruise photographers. You felt like you were getting in the way if you wanted to take a shot with your own camera - which you are of course allowed to do. 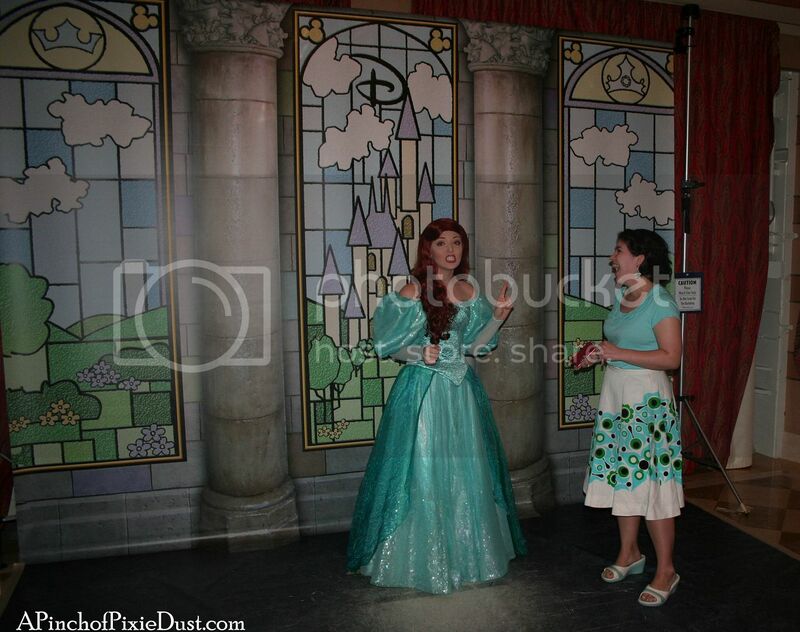 At one point, my mom was taking a photo of us with a character and accidentally stepped in front of the official photographer, and he practically shouted at her to get out of the way, "MA'AM - I'm the photographer." My mom wanted to reply, "I'm the mother!" She's the photographer that matters! Sorry. Rant over. I suppose I should say that not all of the photographers were that rude and obnoxious, and some would politely step back and let you take your own photos. Anyway...BACK TO THE CHARACTERS! I've already written about meeting Princess Anna from Frozen on our cruise, but I had to mention it again, because she was so much fun! And it was so amazing to meet her with such a short fifteen-minute wait, compared to the line at Princess Fairytale Hall! 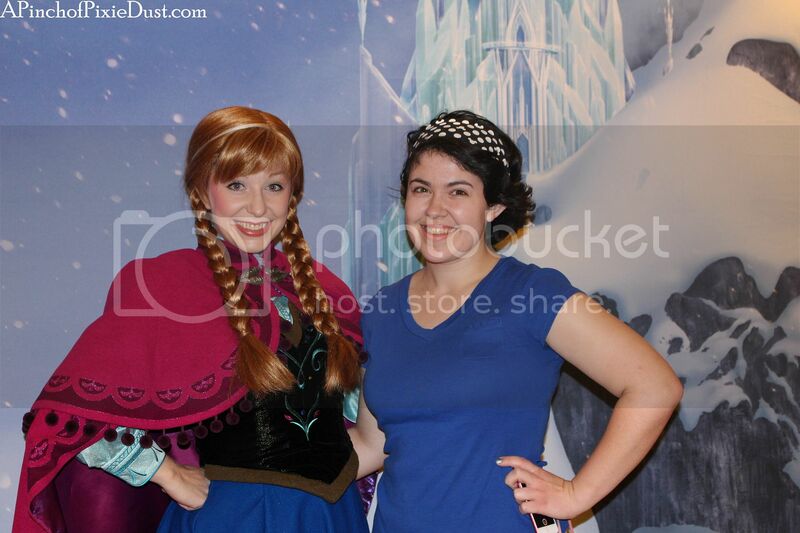 They had a Frozen backdrop set up at Preludes - near the movie theaters, where you could watch the movie Frozen! Ready to meet some Pirates? The second night of the cruise was PIRATE NIGHT - there's a show with fireworks up on deck, a midnight buffet at Shutters, and so many guests bring special pirate costumes to dress up in. It's like a Mickey's Not-So-Scary Halloween Party; everyone really gets into the fun! 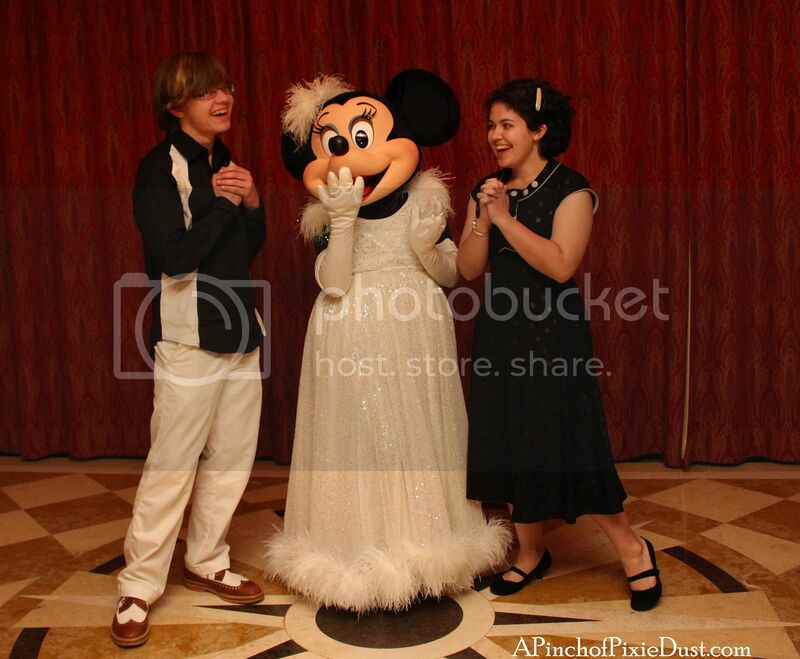 As you can see on the left, the cast members have cool outfits too! It's funny how a great CM assistant can make all the difference when meeting non-face characters. While the Captain and Smee were admiring our outfits, the cast member said the Captain wanted to know if we were good pirates or bad pirates. "Good pirates..." we replied uncertainly. 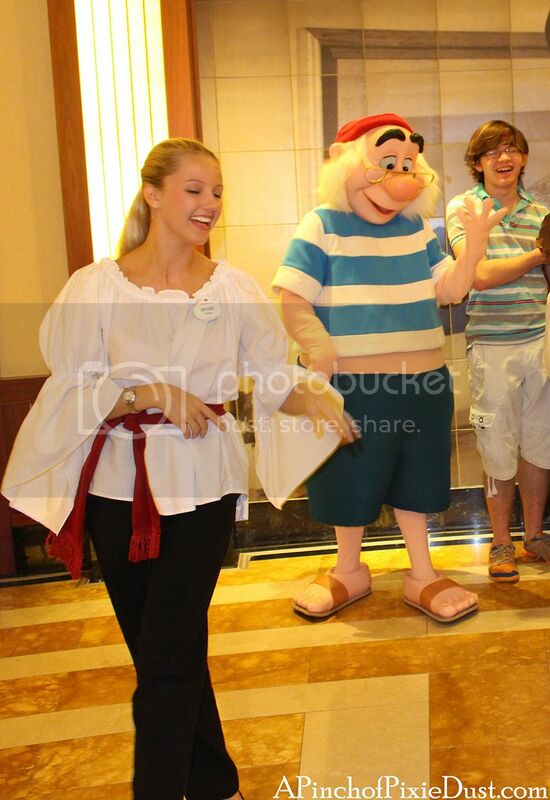 The Captain, who had offered me his arm, removed it, and Smee showed signs of disapproval. One of my brothers cut it - "We're good at being bad pirates!" If the characters have great sailaway costumes and great pirate costumes, you know they're going to have great beach bum outfits as well! There are plenty of character meet and greets on Castaway Cay - you might find a character right outside the gangway when you're getting on/off, you'll find them by the post office, and deeper on the island too. We didn't have time for Captain Jack, but he's a fun one you can meet. There's a character dance party in the afternoon as well. You may notice on your navigator something late on the last night of your cruise called "See Ya Real Soon." It's not quite clear what exactly the event is on the navigator - it sounds like it might be a show. 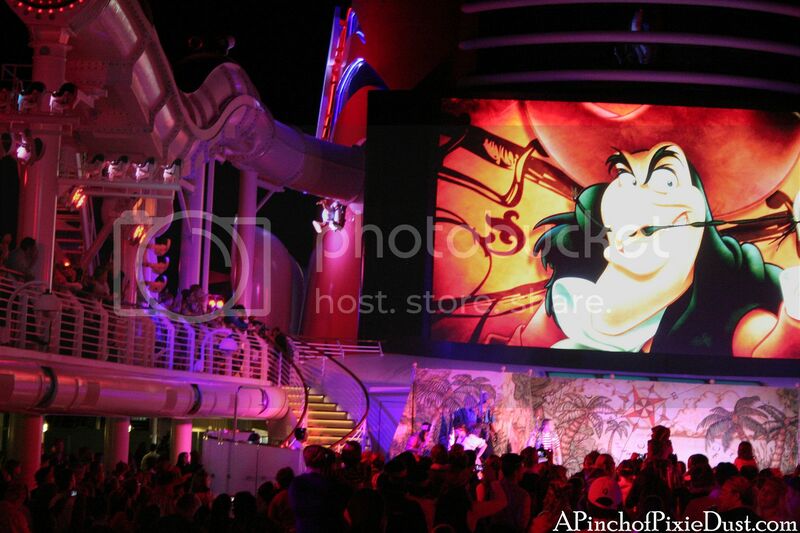 They do show a movie recap of the cruise at the end of it. But what it really is is a character bonanza. Mickey, Minnie, Goofy, Donald, Daisy, Chip and Dale all parade down the main balcony - the princesses and some of the other characters come out too. 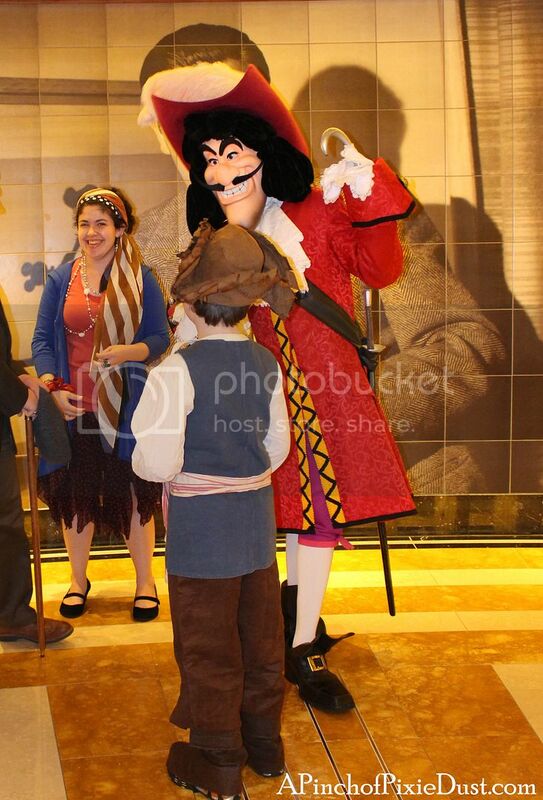 They go to different parts of the Atrium and for the next half hour there are characters to meet EVERYWHERE. The lines for Mickey, Minnie, and the princesses get long fast. 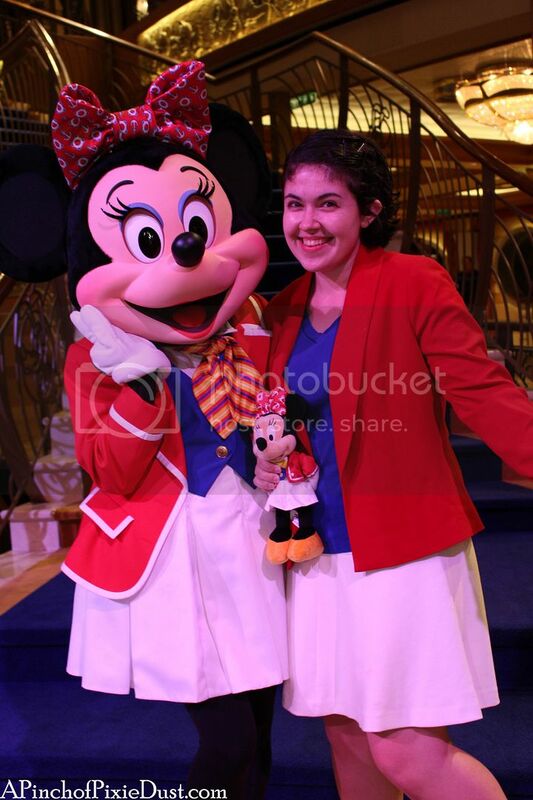 I had an outfit just like Minnie's cruise outfit (I was DisneyBounding as Cruise Minnie! ), and I really wanted to meet her in it. Because I'm kinda crazy like that. ;) So I arrived in the Atrium about ten minutes before See Ya Real Soon began. There were already lots of cast members lurking around; they were there to get the lines started! 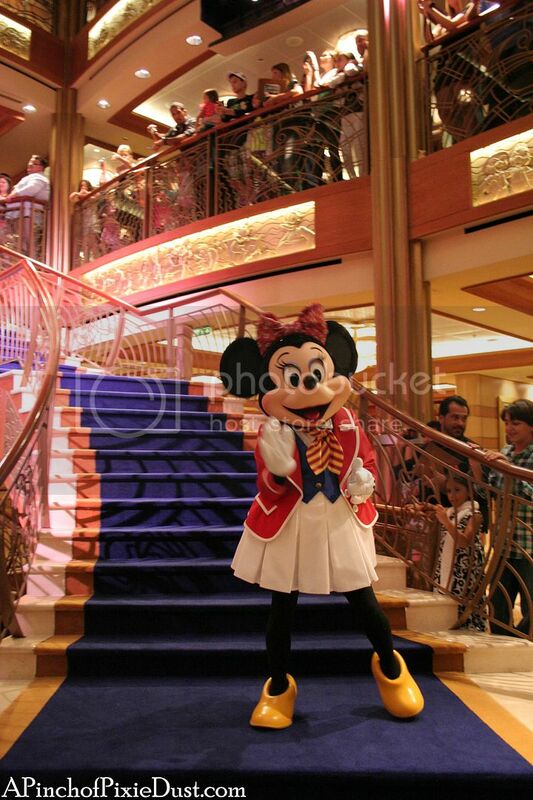 I was told that Minnie was going be standing right in front of the stairs. 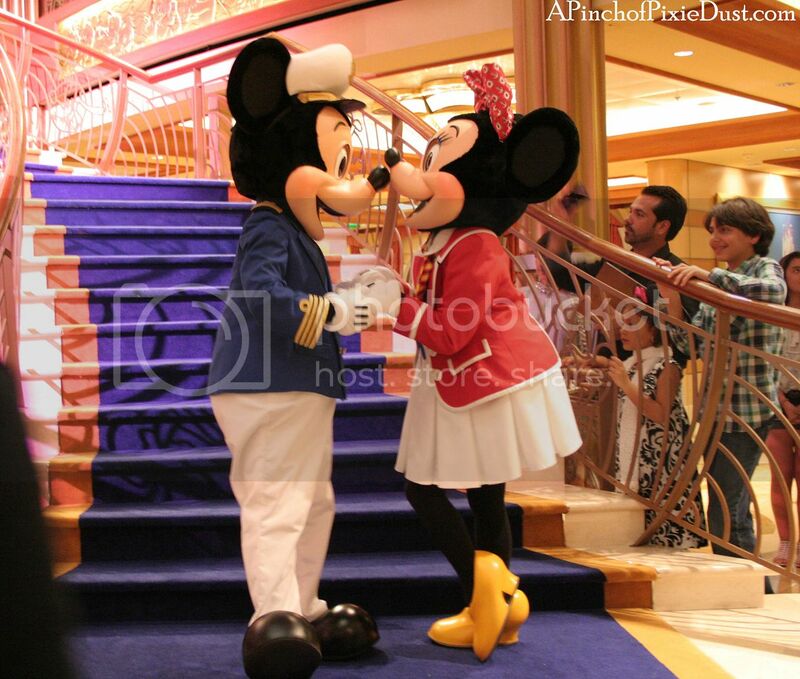 Another couple was already standing and waiting off to the other side of the stairs for Mickey. 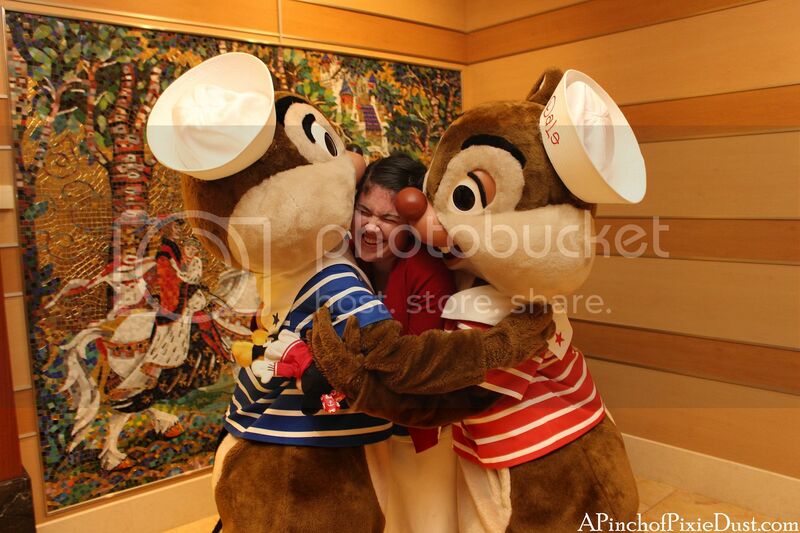 Which cruise character would you want to meet?? We went on the same 3 night Dream cruise last month and loved the characters! So much easier than the parks! Although, I still love the parks the most, it was fantastic! 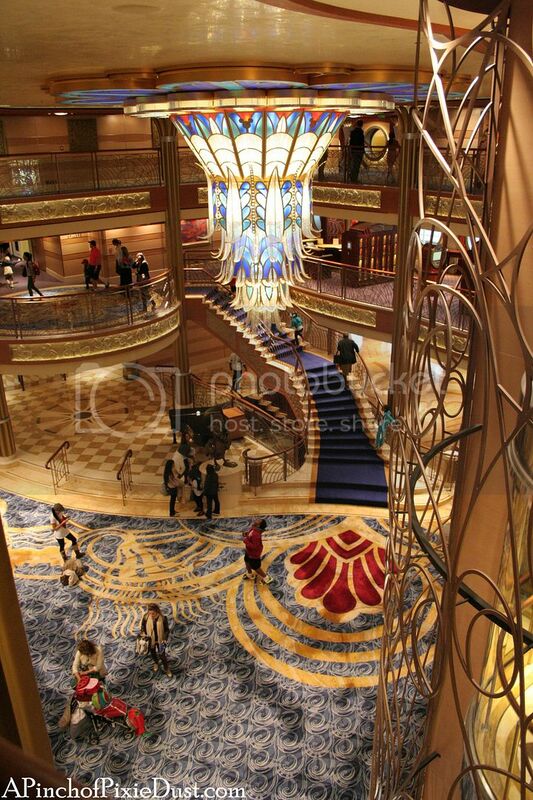 I went on my first cruise last month on the re-imagined Magic. AMAZING!!! It was an Agent Education Program so I didn't have my kids. Just pure grown-up fun. 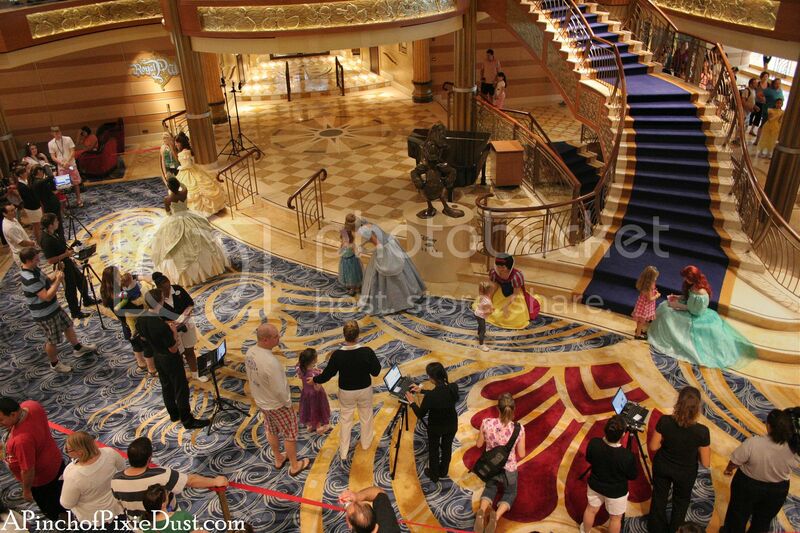 I met Cinderella, Belle, Rapunzel, Daisy (in her cruise gear), Captain Jack (so funny) and Mickey in the cruise terminal. I was so sad that I didn't get a picture with Minnie. 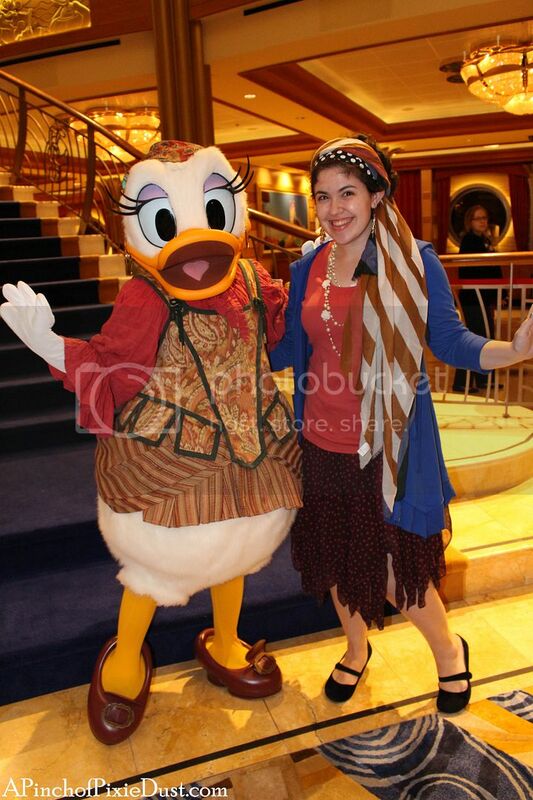 Her cruise outfit is FAB and I love that you matched! 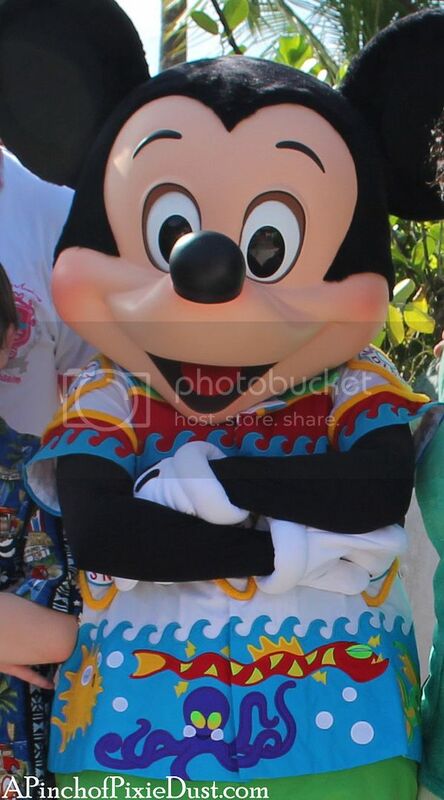 That has been my dream....wear Minnie's cruise outfit. The lines were so much shorter than the parks and the characters were amazing. I also loved how the performers from the shows were out and about at the See Ya Real Soon party. Dancers and singers were paired up with many of the characters taking pictures with our cameras/phones for us. It was awesome!